Christmas on the island of Menorca is not quite as commercialised as it is in other countries. In the past, Menorcans tended to focus on the religious aspects of the holiday, however over the last few years things have started to change a little. More and more local shops now stock Christmas decorations, gifts and delicacies and even some of the towns now put up traditional festive lights. Here we will provide a guide to some of the festive events that take place in Menorca over the Christmas period. Visit one of the islands Christmas markets where you can pick up traditional festive gifts and delicacies. After the tourist season is over Menorca’s population goes back down from around one hundred and eighty thousand people to its usual sixty thousand residents. Due to the lack of demand for flights to Menorca, the airports decide to cancel direct flights from the UK and other countries altogether. If you are planning on holidaying in Menorca this Christmas, you will need to book a flight to either Barcelona, Madrid or Valencia, from which you will be able to catch a flight to the island of Menorca. On the first weekend in December families gather outside the Santa Maria church in Mahón after sun down. There they await the arrival of the Els Llumets, which are four sprites who mark the official start of the Christmas season. The four sprites slide down from the bell tower of the church and put on a magical show which is loved by all generations. They then countdown to the Christmas light switch on and the town is illuminated with spectacular traditional festive lights. 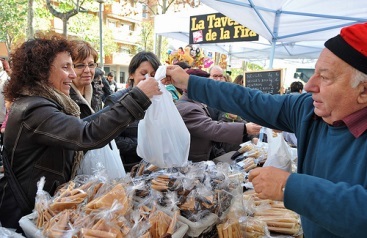 In early December many towns in Menorca host open air and indoor Christmas markets. There you will find individuals selling all kinds of festive produce and traditional Christmas crafts. The markets are the perfect place to pick up stocking filler gifts and keepsakes to remind you of your special Christmas on the island. In the days leading up to Christmas many towns put on a show called Els Pastorets. This is a traditional nativity play where the actors re-enact the story of Christmas. 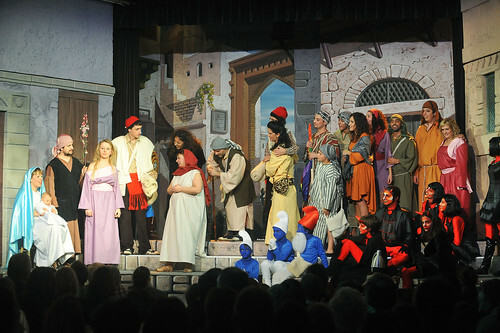 The nativity is usually performed either by townsfolk or local theatre companies. The plays have a true sense of community spirit and are loved by all generations. On Christmas Eve or Nochebuena as they say in Menorca, it is traditional for families to spend time together. They often go to nativity plays or meet with friends for celebratory meals and drinks. Traditional Spanish food such as shell fish, tapas and serrano are often consumed on Christmas Eve. Families then attend midnight mass, where Cant de la Sibil-la is performed by young choir singers at the towns’ churches. Most restaurants are closed in the evening, but more and more bars and clubs now stay open on Christmas Eve so that younger generations can celebrate with friends and party well into the early hours of Christmas Day. Christmas Day in Menorca is rather more peaceful than in other countries. Menorcans usually spend the day visiting relatives, going on family walks and having a celebratory meal. Whilst they do give presents on Christmas day, many presents are saved for the 6th January which is known as ‘Epiphany.’ This marks the day in which the three kings bring gifts for the children. You will find that many local theatre companies put on traditional nativity plays in the run up to Christmas in Menorca. If you fancy a more traditional and less commercial Christmas than you would experience in other countries, then Menorca is the island to visit. Although getting to Menorca in the winter is slightly trickier than in the summer time, it will be worth the extra flight and expense! Menorca is a lovely place to visit during the festive season, as no matter what town you stay in, you will feel a real sense of community spirit. For an unforgettable Christmas, visit Menorca.